You might have passed chervil by when shopping, thinking it was a wimpy version of parsley. The wispy, thin leaves don’t look very tempting. And you might be tempted to overlook it, unaware of its powerful aroma that it lends to certain dishes. But if you’ve never had it, add a handful of chopped chervil to a salad. You’ll wonder why you don’t pick up a bunch more often. Which was a position I was in last week, when for some reason, I saw nice bunches at the producteur stand my market for just one euro each, and decided to ask for them to add one to my basket at the last moment, before I paid. When I got home and unpacked everything, I was a bit stunned to see how huge the bunch actually was. But I’m not complaining, because I love chervil and I’m not convinced it’s possible to have too much. 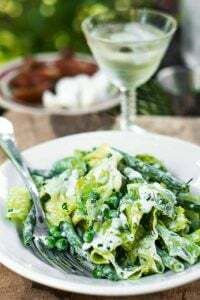 When I worked at Chez Panisse, in the restaurant downstairs, a handful was added to the green salads served after dinner, and customers always remarked on how especially good our salads tasted. Aside from lovely greens picked that morning, it was often flecks of chervil leaves that did the trick. Chervil has a tarragon-like flavor, but is a lot less assertive. Chervil is always used fresh; when cooked, the beguiling flavor of the delicate leaves, reminiscent of anise, are lost. I strew lots of chervil leaves in salads, and use them like a green. However yours truly can only eat so many salads, and when I have a bunch larger than I know what to do with taking up a disproportionate amount of kitchen space, I need to find creative ways to use it. And I mean, a lot of it. I was going to bake the sardines with breadcrumbs and toasted almonds mixed with lemon zest, garlic, and some of the chervil, but that only used just a handful of the leaves. And I was still faced with an surfeit of cerfeuil. I’d been eyeing David Leite’s milk-based mayonnaise ever since I saw it featured on Food52, which was from David Leite’s The New Portuguese Table. It’s a fascinating concept; a mayonnaise made without eggs. Instead it uses very cold milk as a base for the emulsion. Being a skeptic, naturally I was skeptical. But David has impeccable credentials and I knew if the team at Food52 gave it a thumb’s up, it’d likely muster an upward digit here as well. I love egg-based mayonnaise, which most people think originated in France. But there are conflicting stories and it seems that it actually is based on a sauce from Spain. So it seems natural that neighboring Portugal would have their own version. However France picked up the ball and mayonnaise, both homemade and store-bought, are pretty popular here. 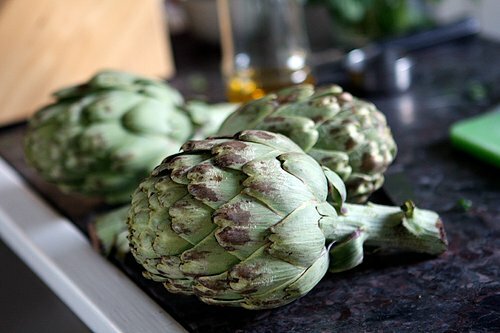 Of course it makes a great dip for steamed artichokes or spiked with lots of garlic for aïoli, served with grilled toasts or alongside crisp vegetables. But in this version, loaded with the lively taste of fresh chervil, it did double-duty with the tasty sardines and the first artichokes of the season. So I guess I have to thank the surprise storm I got caught in for giving me a couple more reasons to use my (overly) generous bunch of fresh herbs. All hail chervil! Adapted from Leite’s Culinary and The New Portuguese Table (Clarkson Potter) by David LeiteThe original recipe says to use either a regular blender, or hand blender. Because milk is more liquid than egg yolks, expect a bit of splattering, which happened even when I used the relatively small pouring hole in my blender. If you have a small mesh strainer, you could put it over the hole to mitigate that. And wear an apron.This would certainly work with any other fresh herb. And if you’re interested in the science of this emulsified sauce, and other variations, you can read more about them at the link above. 1. Mix the cold milk, lemon juice, garlic, and white pepper in a blender. Whiz on high speed for thirty seconds, until light and frothy. If using a hand blender, make the mayonnaise in a tall glass measuring cup. 2. With the blender on high speed, very slowly begin to drizzle in the oil, drop by drop, until it begins to thicken and become emulsified. 3. Continue to add the oil, in a very thin stream, until the mayonnaise is thick and smooth. Do not try to make this too quickly; the process of slowing incorporating the oil should take several minutes. 4. Finely chop the chervil leaves and add them to the mayonnaise, along with the salt. Taste, adding more salt and lemon juice, if desired. Serve the sauce at room temperature. The sauce can be refrigerated for up to one week. Wow – I’ve never ever heard of making mayonnaise with milk before – what a great post! Thank you. We’re “fishing it up” tomorrow – a hot smoked salmon salad for Good Friday and I think I may try this method for the basil mayonnaise that goes so well. Very interesting. Must give this a try. Unfortunately I can hardly ever find chervil down here so unless I grow some myself (and plants don’t seem to do well in my care), I’ll have to try this with some other herb. Amazing recipe. I suppose there are enough proteins in the milk to stabilize the emulsion but the chemistry of it sounds challenging still. Chervil reminds me of my grandmother, who had loads growing in her garden near Provins. Her salads were always loaded with the stuff. Nostalgia… (I can’t find it in Rome). You’re right! I always look at chervil but never buy. (Except once I think I bought a plant to put in my herb garden but didn’t do anything with it. I think it died of neglect.) I’m intrigued by the milk mayo. Gonna give it a try too. Thanks for the post! I have never tried chevril. This sounds really incredible though – I’d love to try it. have been looking for an eggless mayo recipe for the longest time. Thank you! Bookmarked. This looks really easy. One of the many reasons I love your blog is that I fly from your wonderful tales and recipes into my own Proustian reveries. Just now I was carried in a rush of nostalgia back to my mother’s kitchen in 1950’s Jenkintown Pa. As a child, I never thought of my mother as a culinary genius – there were lots of moms back then for whom it was a badge of honor and of worth to produce remarkable meals for their families at the end of each day. My mother was not one of those women, preferring instead to read and write and garden right up to the minute, just before my father got home, when she would whip around the kitchen throwing dinner together in the shortest time possible. But in her own way, my mother was ahead of her time. She believed in fresh vegetables, she didn’t really trust fried food, she served cheese instead of dessert (much to our horror) and she swore that you couldn’t really make a good green salad without the addition of fresh chervil. Where she found it back then, I will never know. 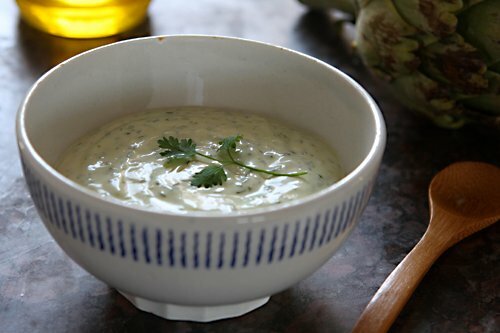 I love homemade mayonnaise and a bit of fresh lemon with artichokes, I have not tried chervil, but will not pass it by again. Great recipe – I didn’t know it was possible to make mayo without eggs. To make it vegan [not that I am] do you think soya milk or rice milk or oat milk could be substituted for milk? Though its not surprising that ou can make a mayo like sauce with milk and no eggs since it is just an emulsion of oil and liquid… just like mayo, what i did find surprising is that it hold in the fridge for so long. The eggs in a normal mayo add flavour, but also the lecithin in the yolk serves to stabilise the emulsion once formed. I wonder what is in milk that is holding it all together, there must be something, as other wise it would separate after short time like when you whisk oil and vinegar in a vinaigrette until it thickens and goes creamy. Leave it for 30 mins and it will have started to separate. One to try for sure! What a fascinating concept. I wonder if it’s any healthier than regular mayo. Per Dyaln’s comment, if it does start separating you could try whisking in a tiny amount of regular mayo (a trick I learned from Cook’s Illustrated for stabilizing a vinaigrette). Just a little bit of lecithin goes a long way! Of course, the mayo would no longer be eggless at that point, but if you’re not avoiding eggs it shouldn’t be an issue. Also David, thanks for alerting us to the chervil– I’ve never seen it, but perhaps I’ve been mistaking it for shriveled parsley. I’ll be on the lookout for it now! I tried this milk based mayonnaise when you first posted the link and love it. Unfortunately I can never find fresh chervil in my area :( Maybe I’ll try and grow it this year. In the mean time a little bit of tarragon might be nice. Thanks for the post! David, I adore chervil! But it’s not that easy to find it in the US. So last year I decided to plant some in my herb garden. I wasn’t able to get too much out of my 3 plants, but they have miraculously survived the winter (I live near NY) and are already sending out new shoots. I am hoping to have a better harvest this year. As for your egg-less mayonnaise… I can’t wait to try it! I also use two oils when making regular mayonnaise, as I find olive oil a bit heavy on its own. Fascinating recipe. I’ll definitely have to try it. 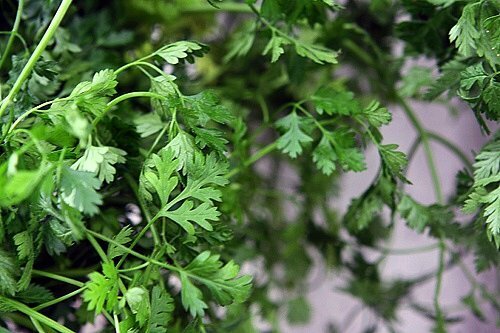 I love chervil–it’s one of my favorite herbs–and I have a lovely bunch growing outside in my herb garden. Claire: This would be good with smoked salmon…hadn’t thought of that! Vivianne: I’ve always used only olive oil, but this one, without the yolk, seemed like it needed to be a bit lighter. Caroline & Dylan: On David Leite’s site (linked in the post), he does talk about the science behind this, which is pretty interesting. It’s really quite a neat idea. Incidentally, I saw some recipes for condensed milk mayonnaise recently, but am not sure if I like the idea of sweet mayo, or not. You know I think Chervil is so under rated. I had not tried any until about 2 years ago. I fell in love with Chervil, it tastes wonderful in egg salad. I tried that and got stuck on the egg salad. I would love try to make my egg salad with this mayonnaise, I am sure it would be wonderfully light and creamy. Love your twist on my original mayo. Now I have to go back in the kitchen and make it. And I can’t wait to try it with sardines, when they’re big and profanely fat. 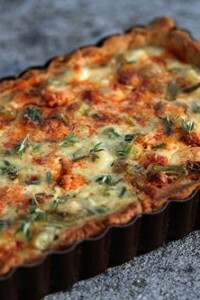 Do you mind if I add your variation to my recipe on my site? Living in Australia, where our cuisine is highly influenced by Asian flavours, I’m mush nmore comfortable with herbs like coriander, mint, and thai basil than more “european” herbs such as tarragon and chervil. But you’ve spurred me on – next time I’m in an herb-seller’s vicinity, I’m going to try something new! What perfect timing. I usually make by own (egg-based) mayo, but since finding out that I’m pregnant and being warned away from raw egg products I’ve had to resort to the jarred, store-bought kind. that is a great idea! I think i’ve seen a few posts about eggless mayo lately , too and i definitely haven’t tried it. i’m not one to consume loads of mayo though, so i guess that’s probably why i haven’t jumped at it. 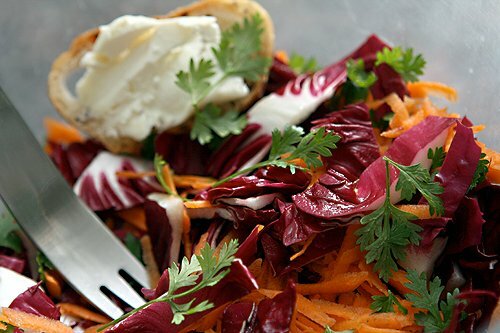 but you’re right – a good way to try that recipe and also give chervil a chance! How about the recipe for those sardines, eh? That sounds interesting! I love mayo made with eggs. As good as this sounds, I can’t justify buying a bunch of whole milk that no one in my house will drink. I will try adding chervil to homemade mayo though because it sounds delicious. I made the egg-free mayonnaise the other day and was so disappointed – I hated it! It tasted sort of metallic and I had to throw it out. I don’t know quite what I did wrong – perhaps it was the wrong kind of garlic? I love garlic, too, but perhaps not raw. JL: Yes, for pregnant women, and people who need to avoid raw eggs, this is a perfect recipe. Stephanie: I think it’d be good with tuna salad, too. other side of the river: I did say how I made them in the post. Just mix the crumbs, almonds, zest, garlic, and chervil in a mini-food chopper with a bit of salt and olive oil, top the sardines, then bake! David: Thank you for sharing this recipe in your amazing book, and on your site. Of course you can use my variation here. This was really interesting to make and I can’t wait to make it again with some of the suggestions on your site, too! I am loving the idea of an eggless mayonnaise! I adore a good herby aioli for dipping artichokes (or the slightly less healthy french fry!) and this looks wonderful. I can barely believe that it holds together without the egg, but I do trust you so I’m going to have to give it a shot. Thanks! What’s colza? Looks like a great recipe. I just made a batch, sans chervil, but with a bit of horseradish mustard at the end. It emulsified, and thickened a bit, but it’s not spreadable like mayonnaise. (Perhaps I dribbled my oil in too fast.) It’s more pourable or dippable; I’d need a spoon, definitely not a knife, with this. In fact, if you’d served it to me without telling me what it’s like, I would have said tasty savoury milkshake, not mayonnaise. Is this as thick as it gets? I love fresh mayonnaise. It puts bottled stuff to shame. I’d love to give this a try, but chervil is not something I see terribly often here in Australia. I might give it a try with Tarragon – the idea of making a milk mayo is intriguing! It is rare to find chervil here in Atlanta. I do purchase some when I happen to see it. I am curious to make mayonnaise with no eggs. I will have to use your recipe when I find some chervil! Now this is a recipe. A million thanks. I have always wondered if a mayo could be made w/out raw egg. There is something about the homemade mayo w/ egg I do not enjoy, and so have stopped making it altogether. I’ve resorted to a store bought safflower version. I am definitely going to try this milk thing at the first opportunity- hopefully tomorrow. What do you think about the use of yoghurt (plain, whole milk) instead of the milk? I don’t particularly like the “egginess” of mayonnaise even though I like mayonnaise. I have been making eggless mayo with milk for a while now. I use a little less oil and add black pepper instead. Also add about a tbsp of honey. Its good! I bought chervil seeds this year, so I hope it will be an adventure adding it to Italian flavors. I will try this, but why is it necessarily mayonnaise? Can it not be some other sauce? Mayonnaise being such an important part of the grande cuisine, seems like a milk sauce could be a breakthrough addition of similar importance? Victor: Mine was quite thick and a spoon could’ve stood up in it. The original recipe says you can add more, or less oil, depending on the texture you want. Mine came out exactly the way I like it, but you might want to consult the original article or recipe as well. maurdel: There is some science to the recipe, which I haven’t read through (which is at David Leite’s original post), but if you do try it with yogurt, let me know how it turns out. I moved to France two years ago and not knowing any of the French brands, I asked a woman in the grocery store what brand she recommended for mayo ( I was hoping to find the French equivalent of Hellmanns). She said I recommend you make it yourself and spent the next 5 minutes telling me how to make perfect homemade mayonnaise. I am hooked and will never go back to store bought ! Stephanie: One can easily buy mayonnaise here, but I’ve never bought it. From what I’ve tasted at restaurants, the bottled stuff here isn’t so wonderful and people who like the taste of real mayonnaise make their own. There is something called Savora which people go nuts over. It’s a condiment made with mustard and spices (which is available online for e hefty price, although I know a few Americans that always bring a few jars back home with them). Some day I’m going to pick up a jar, and give it a taste to see what all the fuss is all about. What a coincidence! 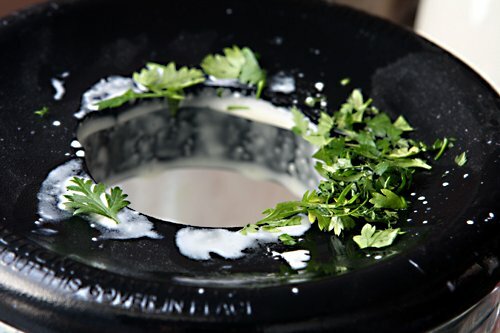 I want to grow chervil this summer, was looking for new chervil recipes, and your newsletter came… I also want to try it in fake boursin made with homemade yogurt cheese. I grew up with Chevril in Germany and think it is much more exciting than Cilantro (more subtle). Mmm… I will look for chervil in the farmer’s market. It sounds perfect for spring. I enjoy regular mayo and especially homemade, so I don’t think I will be trying the milk-based version, but you may have inspired me to make homemade this weekend. Yeah for chervil! Most people have never tasted it and few know how wonderful it is because American cooks have only the dried bottled stuff to sample. Chervil, like cilantro, loses all its mojo when dried: the essence of the herb it too volatile to withstand drying. Thanks for bringing it to light, David. 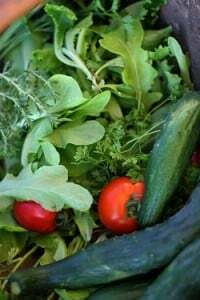 Scratch some seed into the garden in very early spring and you’ll have fresh herb in no time. It bolts in summer heat, so wait until late summer and sow it again for a fall crop that will withstand light frost. Chervil’s been around a long time in France. Lots of medieval recipes use it and it does marry beautifully with cream, eggs, and batters. My favorite one, David, is a little chervil and creme fraiche dabbed on a crepe. But like Susan says above, its time is fleeting in the garden but I did find it growing throughout winter under a greenhouse in New Zealand. So next year, I’ll let that fall sowing survive under glass in the potager. Fresh sardine season. yippee! I just made my 1st successful mayonnaise recently. It was sheer joy! I have never heard of using milk but it sounds like it would add a lovely creaminess. And also make it safer for my niece to eat (I always use fresh organic eggs, but still wary of giving lil ones raw eggs). A couple of possibilities for Mrs. Redboots, whose results tasted metallic. The most likely cause, IMO, is that her milk was on the verge of going off. My young (age 3 and 6) grandchildren have much more sensitive tastebuds than I do, and can detect the milk changes 12 hours before I do – but they are never wrong. The second possibility is using a garlic clove that has started to sprout. My cooking teacher in Boston always told us to remove the green sprout from inside the clove, as it is bitter. David, are they really saying it is made from Rutabaga seeds? And thanks for all your truly incredible blogs. About mayonnaise made with sweetened condensed milk. Growing up in Australia in the 1950’s, that WAS mayonnaise. Imagine my delight when I discovered the real thing many years later. Same story with cheescake, also made with sweetened condensed milk back then. I like the sound of this milk version. Would adding lethicin perhaps help with thin results? As I read this I thought I HAD to try. I never made mayonaise before, and this totally intrigued me! I tried it and it came out beautifully (little less oil (sunflower), used immersion blender), I made it with chopped parsley, and it’s on its way into a potato-salad now. I am not sure if it will work with yoghurt but I’m sure stirring in some yoghurt afterwards will work just fine! tried it-loved it-blogged about it. Thanks, Margot, for your suggestions; I might try again when I know the milk is fresh and the garlic not sprouting! This recipe sounds delicious, I can’t wait to try it. Although I enjoy the taste, traditional mayonnaise frequently makes me sick. I’m hoping the use of milk instead of eggs in this recipe will solve the problem. Can you make this in a food processor instead of a blender? Oh, this looks wonderful! I will definitely be making this. Thank you very much for the recipe and the background information on it. For me, so much of the enjoyable aspect about food is learning of its origins and side stories. Yes, this is very old and popular way of making mayonnaise in Spain as well. They call it Rosa Sause. They also put a tbl spoon of whiskey and tomatoes, instead of lemon, they put juice from a half orange. Try it, you might like it. It is traditionally served with poultry and fish dishes.